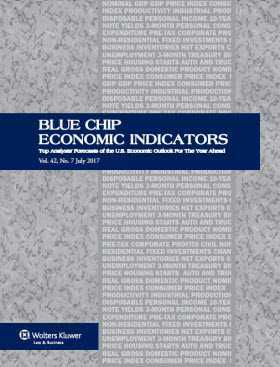 Each month since 1976, Blue Chip Economic Indicators has polled America's top business economists, collecting their forecasts of U.S. economic growth, inflation, interest rates, and a host of other critical indicators of future business activity. Our 30+ year track record of providing corporate and government decision-makers with our survey results has made Blue Chip Economic Indicators synonymous with the latest in expert opinion on the future performance of the American economy. Each issue of this 16-page newsletter contains forecasts from 50-plus economists employed by some of America's largest and most respected manufacturers, banks, insurance companies, and brokerage firms. Each forecaster's prediction is published along with the average, or consensus forecast, for each variable. There are also averages of the 10 highest and 10 lowest forecasts for each variable; a median forecast to eliminate the effects of extreme forecasts on the consensus; the number of forecasts raised, lowered, or left unchanged from a month ago; and a diffusion index that indicates shifts in sentiment that sometimes occur prior to changes in the consensus forecast. Special Questions: The results of special polls of the panel on questions of topical interest, i.e. monetary policy, fiscal policy, major influences on the outlook for growth, inflation, etc. Databank: Two years of historical data on 28 critical indicators of business activity. Calendar: A calendar of upcoming government and private sector data releases, Federal Reserve meetings, etc.